Although firmly rooted in ancient East Asia cultures, stone appreciation has no necessary boundaries; around the mid-twentieth century it found a congenial reception in the West, where it slowly began to flourish. While after more than a half-century, Asian perspectives on connoisseurship of natural stones have become well established in the West, books on viewing stones still predominantly feature East Asian examples. 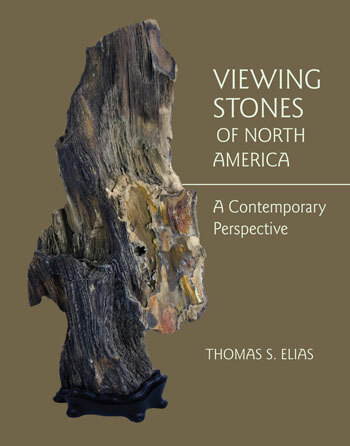 This is the first book to feature outstanding North American viewing stones from private and institutional collections, and includes introductory essays on Native American stone appreciation and a brief history of stone collecting on the continent. North America has a rich and varied geological history that is yielding many types of beautiful and unusual stones. Some resemble natural features, plateaus or mountains with cascading rivulets, while others are figurative, portraying creatures real or mythical. Some are abstract in form, while others exhibit appealing shapes, beautiful colors, or fascinating surface patterns. However, all share one quality: an ability to elicit an emotional response in the viewer. They confront us with the beauty and diversity of the natural world and demand a response, while we are drawn, willingly, to comply. Sixty-three individuals and institutions participated in this project. From over 330 professional photographs submitted for consideration, 151 stones were selected for inclusion. A jury of stone enthusiasts evaluated each submission based on seven criteria, without knowing the identity of either collector or owner. The result is fabulous array of beautiful and unusual stones from a diverse group of collectors, demonstrating not only the richness and diversity of the continent's geological resources but also the vibrancy and enthusiasm of the North American collecting community. Dr. Thomas S. Elias, former Director of the U.S. National Arboretum, is the Chairman of the Viewing Stone Association of North America, Honorary Vice-Chairman of the Viewing Stone Association of China, and President of the Southern Breeze Tree and Stone Society of southern California. Dr. Elias is the recipient of the prestigious Order of the Rising Sun with Gold Leaves and Rosette from the Emperor of Japan, and was honored by the Japan Suiseki Association in 2014 for his contribution to the understanding and promotion of Japanese style stone appreciation. He is the co-author with his wife, Hiromi, of Chrysanthemum Stones: The Story of Stone Flowers (2010), and co-author of Spirit Stones: The Ancient Art of the Scholar’s Rock (2014).